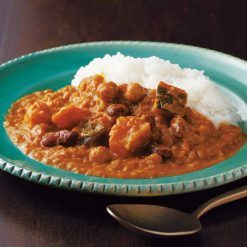 A hearty curry made with vegetables (kabocha pumpkin, potatoes, carrots) and beans (chickpeas, red kidney beans). The highlights of this curry include the sauce, which is flavored with the umami of lots of sautéed onions, and the fragrance of its spices. Simply boil in bag, or pour into a container and microwave, and enjoy. In Japan, curry thickened using ingredients such as wheat flour or roux is typical. Japanese curry often contains potatoes, carrots, and meat. In India, curries vary from region to region, but many do not use roux. Many Indian curries are cooked with vegetables such as onions and tomatoes. 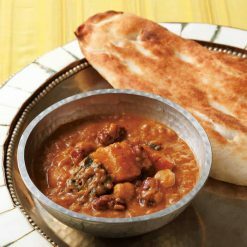 This hearty Indian-style curry is made with vegetables (kabocha pumpkin, potatoes, carrots) and beans (chickpeas, red kidney beans). The highlights of this curry include the sauce, which is flavored with the umami of lots of sautéed onions, and the fragrance of its spices. 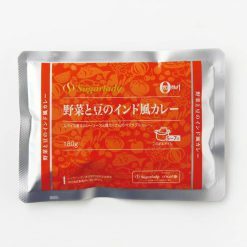 To prepare the curry by boiling, place it in boiling water without removing it from its bag. Cook for 5 to 7 minutes, then transfer to a bowl and serve. To prepare the curry in the microwave, pour the curry into a container (make sure the container is deep and heat-resistant), then cover the container with plastic wrap and microwave. Approximate cook times: In a 500W microwave, cook for 2 minutes. In a 600W microwave, cook for 1 minute 30 seconds. This product contains sautéed onions, fried kabocha pumpkin (kabocha pumpkin, soybean oil), potatoes, coconut milk, carrots, tomato purée, red kidney beans, rapeseed oil, chickpeas, chickpea paste, yogurt, fig paste, curry powder, white roux (wheat flour, lard), cashew nut flour, butter, banana purée, table salt, chicken extract, ginger paste, sugar, yeast extract, beef extract, spices, garlic paste.. This product is not suitable for anyone with allergies to milk, wheat, beef, soy, chicken, pork, banana or cashew nuts. Origin of ingredients: onions (China), kabocha pumpkin / potatoes / carrots (domestic). Prepared and packaged in Japan.